Pictured above group 2 were Beau, Buddy and Beckie with mum Molly . 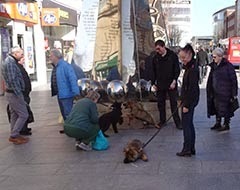 We started with an introduction to tracking before we all headed off in our groups into Exeter city centre for some socialisation and to see how the pups coped with the large crowds and all the noises and hustle and bustle of a busy city centre. All of the pups were very confident and coped with everything that came their way. They were mobbed by everyone they came across and I didn’t see any of them in the slightest bit fazed. Although the pups were still only 12 weeks old and some might question the wisdom of exposing them to such a busy situation at such a young age I was very confident that they would all enjoy the experience and find it stimulating and exiting. The scientists tell us that up to 16 weeks puppies can cope with most things if introduced sensibly and that after that they are not as well equipped to deal with new situations. Here are some pictures of our day out. 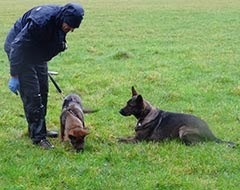 Buddy, Becky and Beau waiting while their handlers take a well earned rest. Boris and Bruno playing together while Blade chills. Blade chilling out again which was a feature of the day. The following weekend was one of mixed emotions because it was time for Mollie’s last remaining pup Bebe to go to her new puppy walkers. As much as I had enjoyed having Bebe her mum Mollie was getting frustrated with Bebe constantly badgering her to play and so it was time for her to develop on her own with her new family Chris, Donna, Jake and Tom Highton. It was made easier knowing that she would be well looked after and have lots of fun with her new family who did such a great job with their first pup Cleo and more recently with Betty who is now on the current Initial Police dog course undergoing her training. 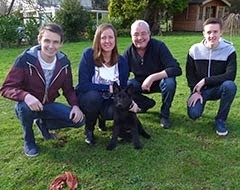 Here is Bebe with her new family. What a contrast on our next training day Sunday 2 March when it rained all day. Mum Molly likes to see her pups before we start the training and here she is meeting Beckie, Boris, Brodie and Buddy in Plymouth at 11am. 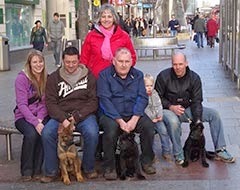 At 2pm we did our second session with Bebe, Bruno, Blade and Beau in Exeter. The first exercise on the training was tracking which we always do at the start of all training sessions. Tracking is the following of a trail left by a criminal or missing person. 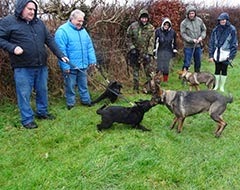 The dog follows the direction the person has gone by following a combination of the ground disturbance and the person’s individual body odour and is the most important skill of a Police dog. We start the training by placing raw tripe in every footstep made by the person laying the track and the dog makes the association that following footsteps brings very tasty rewards. Pictured here is Buddy starting a trail and Mum Molly is supervising and no doubt passing on useful tips. I am the strange individual laying the track and with my rubber gloves looking like someone working in a chemical plant. I have known dogs successfully follow tracks that are over 24 hours old across rural land and several hours old in busy built up areas. 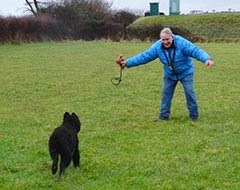 To reach this level takes many years of hard work by the handler and his/her dog. After tracking we discussed the importance of a Police dog having an immediate recall to handler in all circumstances. This is started by the handler making himself exciting running backwards with arms outstretched and calling the dogs name shouting the instruction to come whist at the same time using his favourite toy being jerked on a rope along the ground as the pup arrives and a great game then ensues. Pictured here is Ken calling Boris who responds like a rocket for the game with Ken. Ken did such a good job that I asked him to demonstrate it again without telling him we were going to let all the pups go at the same time. The above shows Darryl recalling Beau and at the same time giving an impression of a parachutist about to jump out of a plane. We then introduced the pups to article searching which is the searching for and indicating any article which has recently been handled. This is an important exercise because criminals often discard tools they may have used to commit crime or drop property they have stolen. With the advances in DNA locating articles is very important as we can get the criminals DNA from the article or property thus tying him to the crime. We start this as a game where the dog sees the article thrown and is allowed to chase and retrieve it. This is eventually progressed to the dog searching for articles without seeing them thrown and on locating the article freezes on it without touching it to prevent contamination. Pictured here is Brodie starting this training. 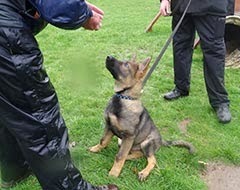 We then finished the session practising getting the pup’s to sit and lie down on command. We also introduced the stay exercise which is where we require our dogs to stay in the sit or down position until we release them from that position. 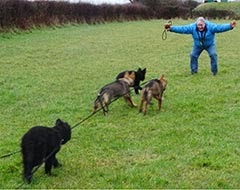 Being able to leave the dog in a stationary position until released is the bedrock of obedience training and is utilised in many different situations. Pictured here is Bruno showing excellent concentration on the start of the sit stay. Unfortunately most of the photo’s taken on the second session were ruined with rain on the camera lens. I am off on leave for a couple of weeks and on my return I will be working with the A litter as we work towards their assessments in April.